There are two time limits you need to be aware of when it comes to iTunes Movie Rentals. The first starts once you play the rented movie for the first time. After hitting play, you have just 24 hours to finish watching the movie. If you don't finish watching it in that time, the movie will expire and be unplayable. The second time limit is how long you have to watch it the first time after download. In this case, you have 30 days from the day you rented the movie to watch it. If you don't watch the movie in that 30 - day, your rental will expire. This multifunctional M4V rental converter helps you to convert M4V for playback on iPod, iPhone, Apple TV. Or customize main parameters for your needs. It can convert M4V rentals to popular formats like MP4, MOV. How can you break the DRM limitations? One way to break DRM limitation is you can remove the DRM protection. You can find a software and use it to remove DRM. After the DRM removed, the iTunes rented movies can be played everywhere you like. I would like to recommend a strong DRM removal tool called M4V Converter Plus. 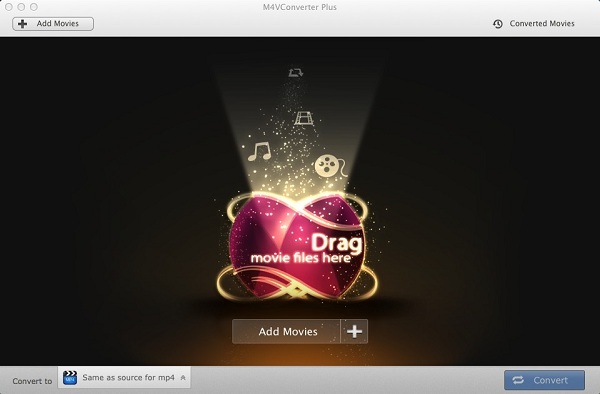 This M4V converter software will break the limitations of iTunes rented movies and convert them to unprotected files. To match your own player, it allows you to customize parameters yourself. 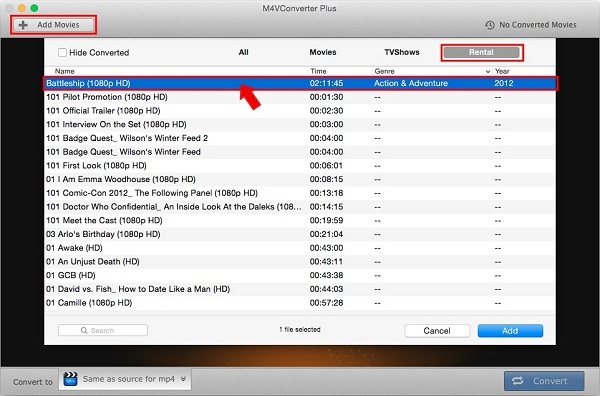 With this DRM removal converter, you could play your movies rented from iTunes store freely. You can convert your DRM protected movies with a high quality. Also, you could locate your output files by yourself. Or drag the movies to add them directly. So, remove the DRM limitations with M4V Converter Plus, and play rental movies at any time. 1. Go to download M4V Converter Plus to make a free try. The DRM removal tool has a trial version which allows you to convert 1 minutes one time. After purchasing, you will receive registration code immediately. And you are permitted life upgrade for free. 2. Add iTunes movie rentals you want to convert. Click the button "Add Movies" in the main interface. Choose the iTunes M4V rental video files from your iTunes playlist. Then click "Add". 3. Find the suitablt file format you want to get. Click "Convert to" profile foramt list to choose right output format. You can see M4V Converter Plus supports various formats such as m4v for ipod, m4v for iphone, MP4, MOV, AVI, etc. 4. After all done, start the conversion. To hit "Convert" to remove DRM from iTunes movie rentals. You can check your videos converted by clicking "Converted Movies" after conversion.